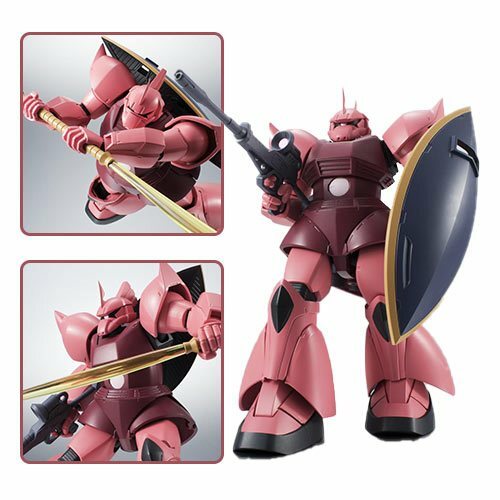 From Bandai Tamashii Nations comes the Mobile Suit Gundam Gelgoog Char's Custom ANIME Robot Spirits Action Figure! Sculpted to capture the distinctive appearance of the televised animation, it features excellent posability and numerous effect parts. The figure includes 4x pairs of optional hands, 3x beam-naginata effect parts, a shield, a hand storage deck, a beam rifle, a beam rifle effect part, 4x Vernier effect parts, a damaged shoulder part, and a joint set. Measures about 5 1/10-inches tall.